Last week I published Summer of Ice Cream: Part One in which I showcased the top 8 ice cream cones around the city. 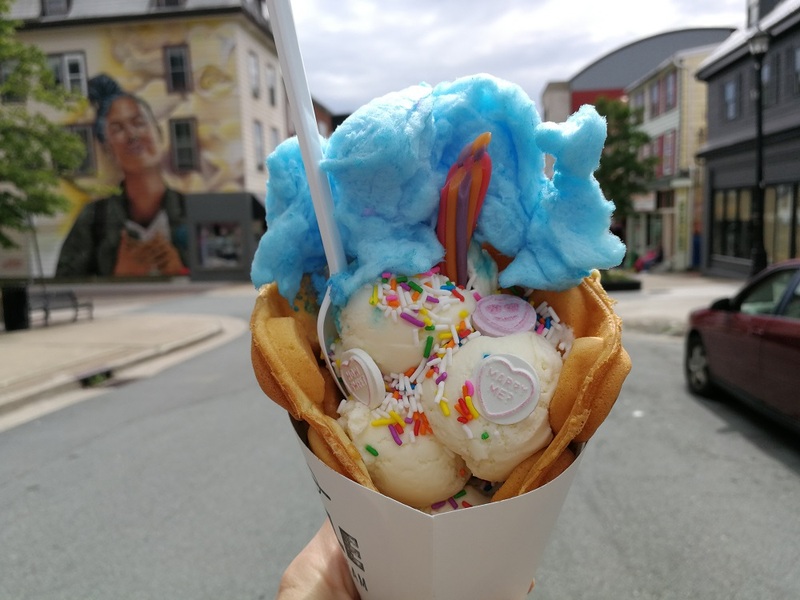 This week I’ll continue my list of the best ice cream in Halifax, this time with the craziest, novelty feats of ice cream construction! Coming to an Instagram feed near you! Or just an old fashioned feed – the kind where you eat things. Enjoy! Tag me in all of your #SummerofIceCream tweets and posts and let me know what you think! Let’s start with a classic. 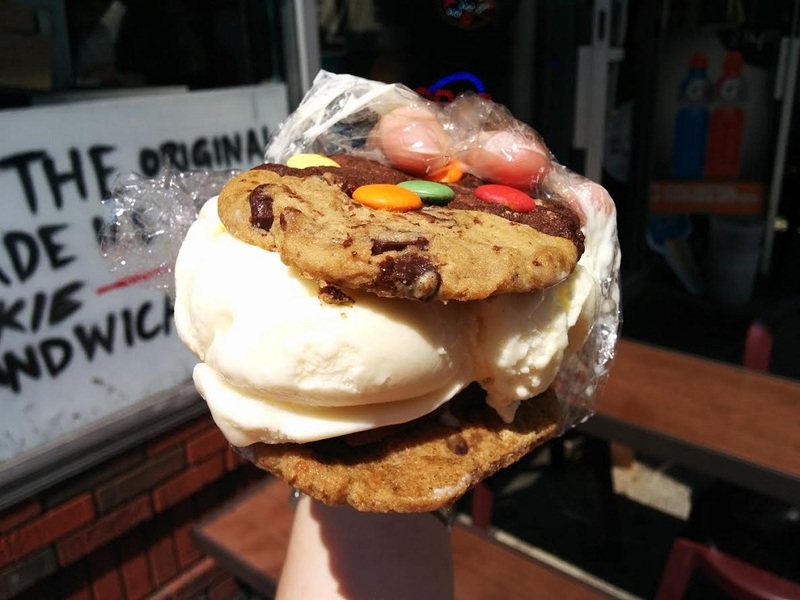 The ice cream sandwiches at Jubilee Junction have been legendary since before soft serve went gourmet and matcha went viral. There is a fridge full of premade ice cream sandwiches in chocolate and vanilla, so it is frowned upon to request vanilla ice cream when you go to the counter for a custom-made sandwich. The clerk begrudgingly scooped vanilla ice cream into what could have been a more colourful and creative concoction of my own design. Choose your magic ingredient (a mini chocolate bar to get smushed into your sandwich)! Ol School Ice Cream’s sundae cones bridge the gap from last week’s post, as it is both an ice cream cone and a sundae all in one! These are the folks behind Ol School Donuts, now with a brand new truck slinging ice cream treats in a suburban centre near you! (Recent sightings in Dartmouth Crossing, Lower Sackville, Bedford Highway and Enfield). I mentioned the soft serve at The Dairy Bar in Part One because it is entirely delicious, but I’d be doing a disservice if I didn’t mention their sundaes! 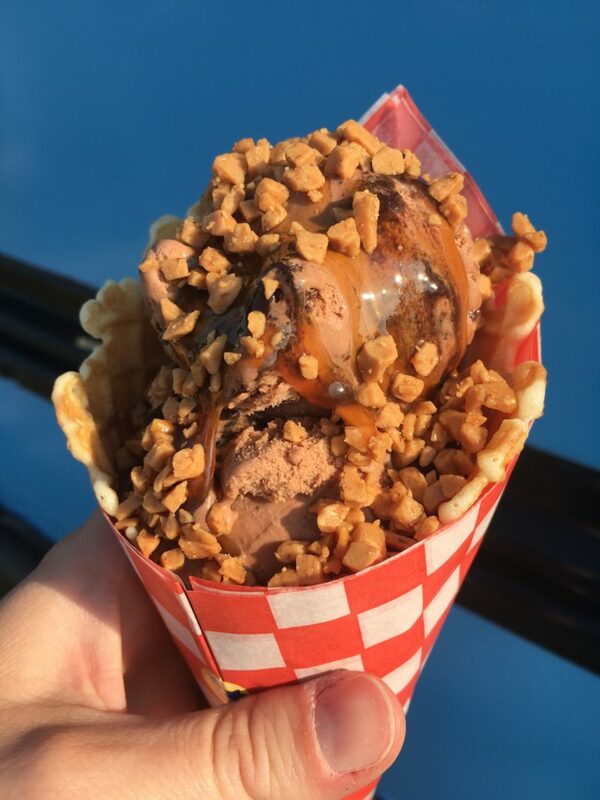 Pictured is their signature “Crunch” Sundae, which features salted caramel and a cereal crunch. 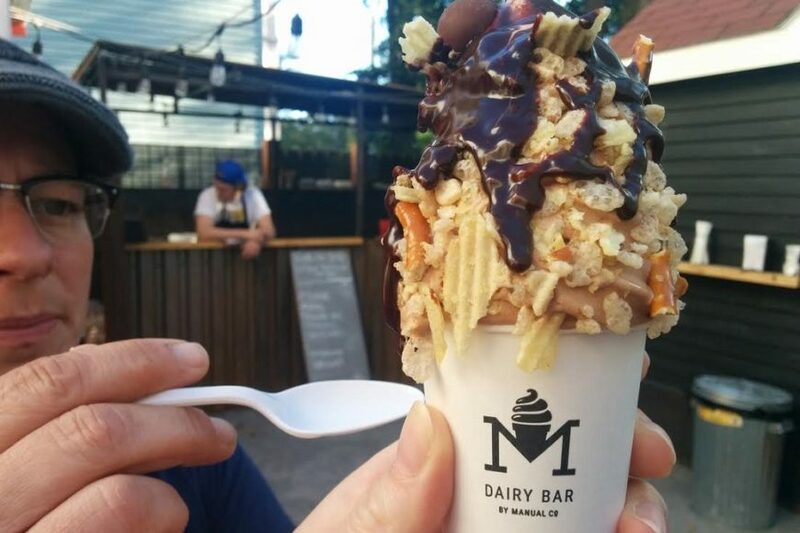 It is cerealiously good and you’ll immediately forgive yourself for spending $7.50 on an ice cream. You can also build-your-own sundae from the available add-ons: chocolate fudge, lemon curd, cereal crunch and potato chips! Taiyaki is a Japanese street food. 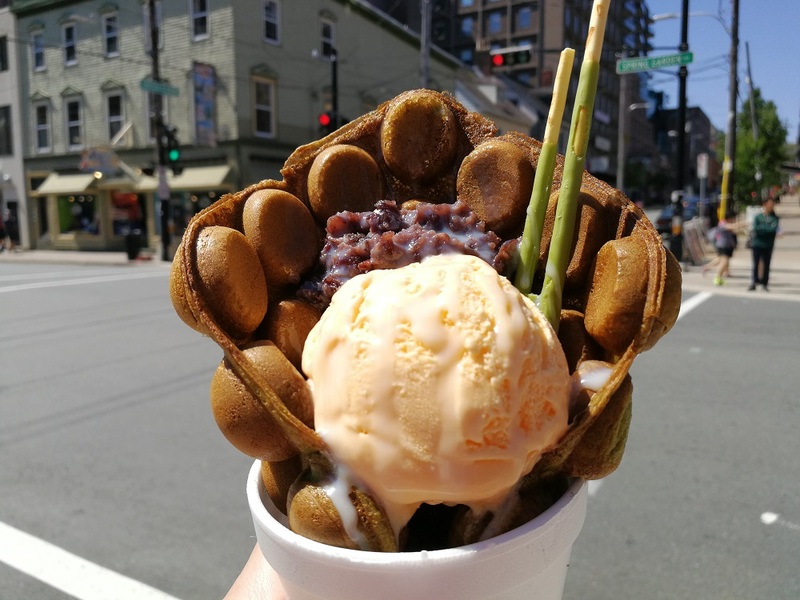 Essentially, it is a fish-shaped waffle stuffed with custard or red bean paste and literally translates to mean “grilled sea bream”, which must have confused at least one person who expected to be in a seafood restaurant but instead wound up in a waffle house! 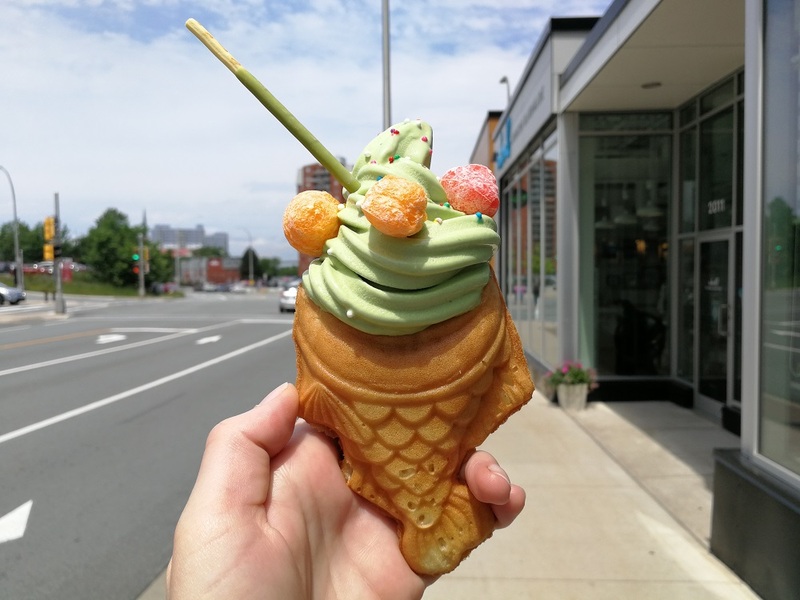 Taiyaki 52 has introduced this treat to Halifax, but this cafe isn’t just a one-trick seahorse! You can get your taiyaki made into a ham ‘n cheese sandwich. You can get it extra crunchy, with a brown sugar crust. You can get a taiyaki made out of sticky rice. Your taikyaki can even be vegan (banana & soy milk-based). But most excitingly, you can get it as an ice cream cone! There’s matcha and mango soft serve (available as a twist) and fillings include: sweet red bean, vanilla custard, matcha custard, chocolate hazelnut, blueberry and blueberry & cream cheese! I found the ice cream a little top-heavy, but the soft serve and stuffed waffle were so delicious I may have eaten some of it off the pavement…. Be Careful, Instagramers! Another trendy item making its way from Asia to our very own city streets is the Hong Kong bubble waffle! Go 2 Eat is hidden in the basement underneath Sushi Jet, but there you’ll find a small cafe specializing in Taiwanese and Cantonese desserts! You can get your bubble waffle in 3 flavours: Original, Chocolate, and Matcha. Then you choose your ice cream: vanilla, chocolate, mango, strawberry, matcha or black sesame (when available). Finally, you get to choose 3 toppings from a lengthy list! There’s a secret basement serving maaaagical waffles…. The folks at Portland Street Creperie have jumped into the bubble waffle game with their creative signature waffles. Exhibit A: The Unicorn Bubble Waffle: vanilla ice cream with sprinkles and candy and topped with cotton candy. I really enjoyed the cute mini-scoops and was surprised by how well the cotton candy complimented the ice cream! The bubble waffle itself wasn’t as crispy and fresh as Go 2 Eat, but points awarded for artistic vision! Mega Instagram points. I’ll give this a rating of 4 unicorn horns and a Pikachu out of Little Hello Kitty Mermaid. Roll on Two specializes in Hungarian “chimney cakes”, which are tubular pastries sprinkled in cinnamon sugar. Or you can get ’em rolled up with sprinkles, crumbled Oreos, coconut, almonds, walnuts, or brown sugar. You can even get ’em stuffed with a hot dog! But the piece de la resistance is their sundae cone. The chimney cake is rolled in cinnamon sugar and filled with Nutella before being turned into a vessel for soft serve ice cream! You want it sprinkled with almonds, sprinkles and chocolate syrup? You got it! This might be the most ridiculously good ice cream treat I’ve had. It’s stupid good. I was full of happiness and calories for the entire day. 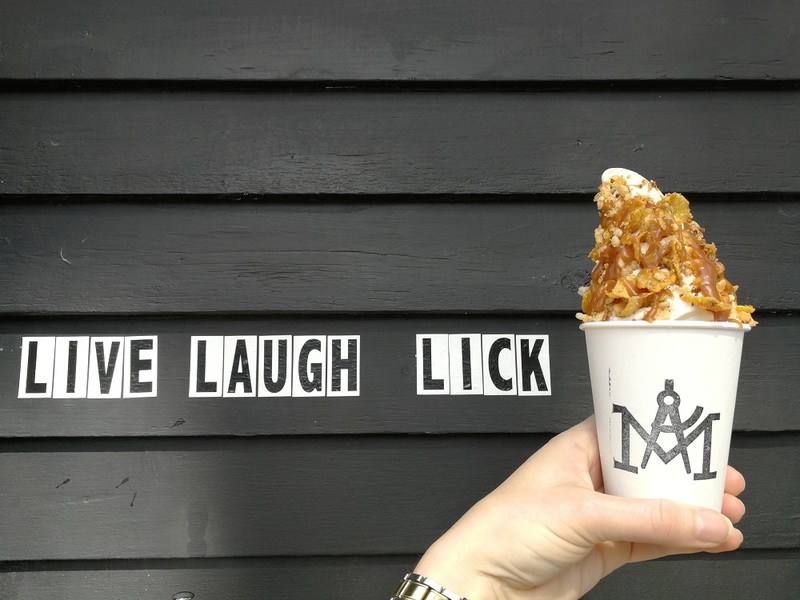 Unfortunately, Roll on Two has vacated their Granville Street shop and are temporarily serving their chimney cakes at the Seaport Market – only on weekends and currently without ice cream. 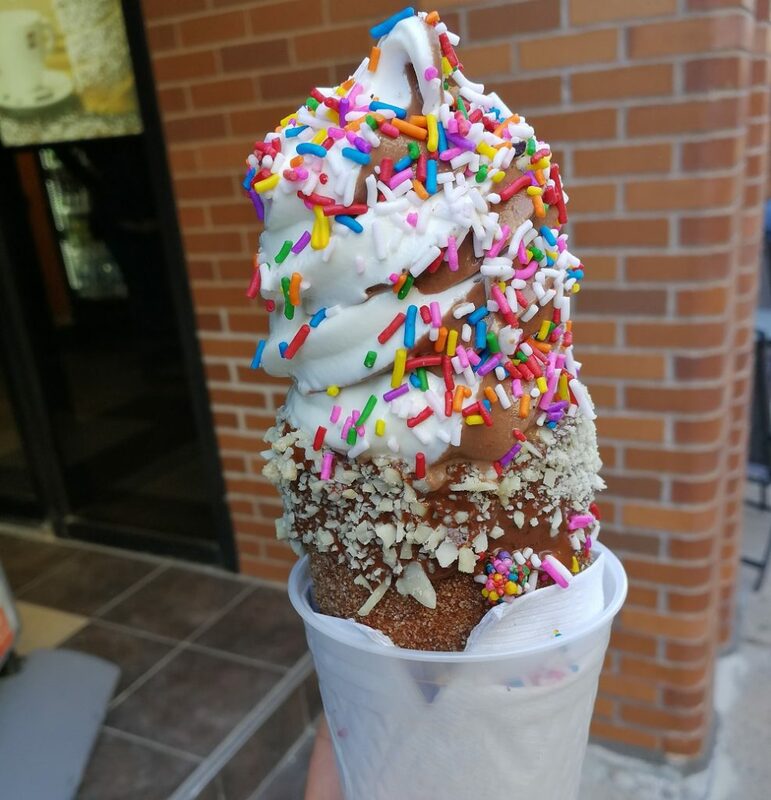 But keep your eyes open, because the chimney cake sundae will resurrect once more! Okay, so apparently I’m not done with cones yet – but how could I forget Scanway’s Grafton Street Cafe? 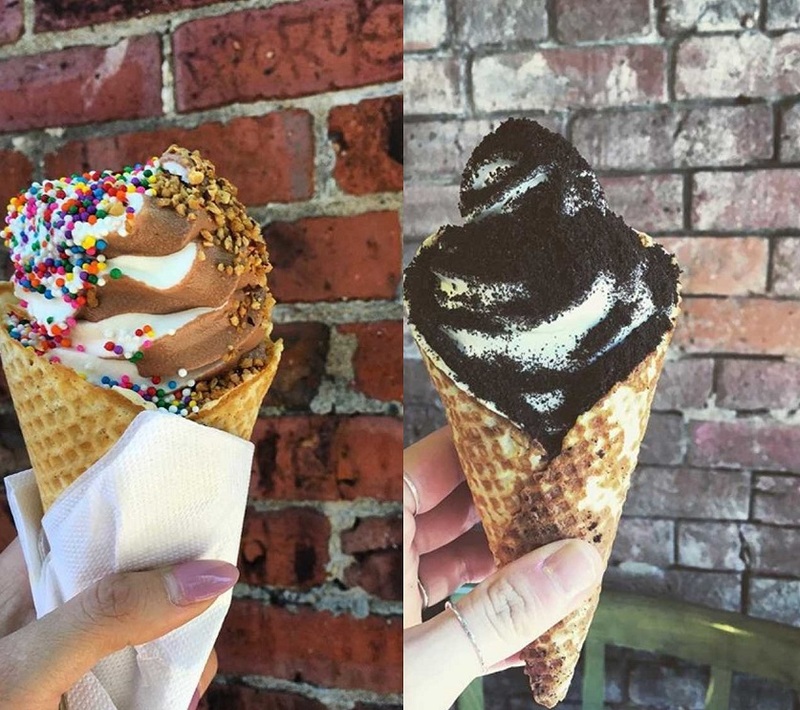 They used to do gelato but nowadays they’re whipping up house-made soft serve in classic chocolate/vanilla/twist, with all kinds of toppings, and house-made waffle cones. If you ask nicely, they’ll even make you an ice cream sandwich with one of their decadent doughnuts! 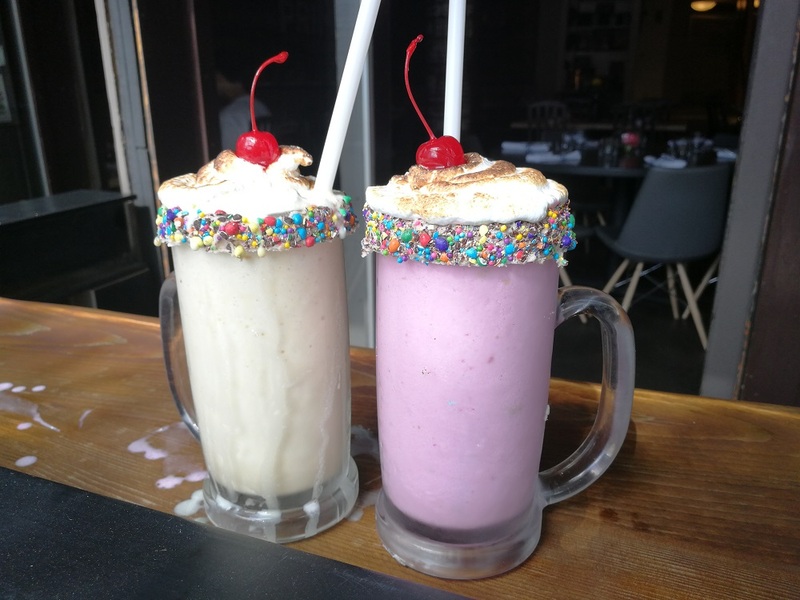 Just to shake things up, my bonus milkshake is a hybrid of your favourite craft beer with the following milkshake flavours: Vanilla, Cherry Cheesecake, Cookies & Cream, Chocolate Brownie & Espresso. Choose carefully, my friends: my server recommended an Unfiltered DIPA w/ vanilla but this is not for the faint of heart! May I suggest: Good Robot’s Goseface Killah with a cherry cheesecake milkshake! A chocolate candy rim and torched whipped cream elevate this drink above the other boozy shakes in town. Pro-Tip: these babies are only $6 during Happy Hour – 2pm-6pm every day! 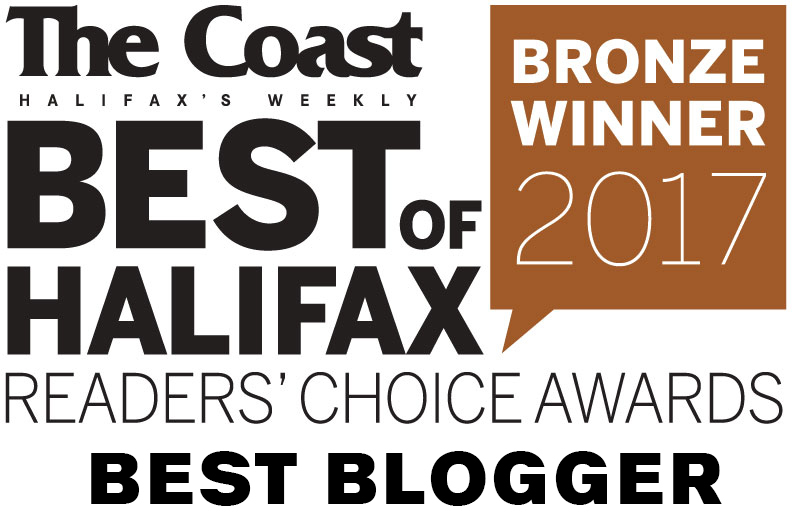 There you have it: the best ice cream in Halifax! How many of these have you tried? What are your favourites? Talk to me, food lovers! 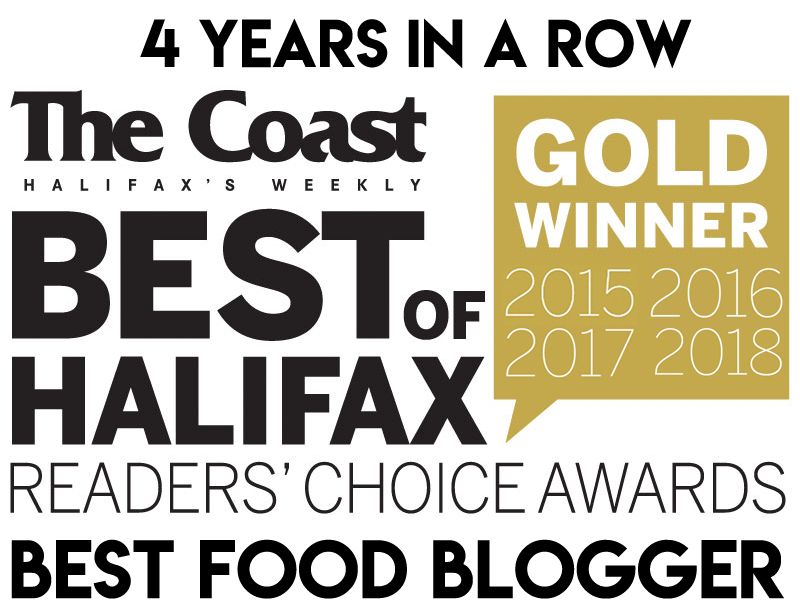 If you enjoyed this post, please take a minute to vote for me for Best Food Blogger in the Best of Halifax!